I fell over this image while looking on the web for a suitable image of an agent. It’s actually an ad for a typewriter. 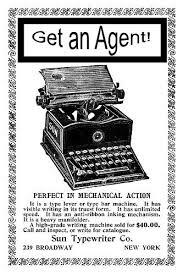 The one shown here is so old they’re calling it ‘a writing machine’ in the sales blurb. Amazing, I couldn’t resist it. Your manuscript is complete. You’ve had it read by your writing group, or professionally appraised, and that seventeenth redraft seems like the one, the finished product. What now? You want to approach agents and publishers, and get your work read. Before you send it out there, here are some important tips to help you make the most of the submission process. 1. Check what types of work the agency or publisher represents before you send anything. 2. Contact them and ask for their submission guidelines – follow these carefully. 3. In your proposal, send a cover letter, a synopsis and a sample of your manuscript. The cover letter of your book proposal will be the first impression you make, and it’s almost as important as your manuscript. Editors and agents are extremely busy, so a good, professional and informative cover letter will greatly improve the chances that your work will be read. Introduce yourself (briefly), outline your writing (briefly), and tell them why you think they should represent you or take your work. Keep the description of your work to two or three sentences; save the details for your synopsis or chapter outline. You can mention some book titles you think are similar to your own (three at most), especially if these titles or authors are represented by their company, to give them an idea of the genre and audience you’re aiming for. Alternatively, you can distinguish your title from others on the market that might appear to be similar, e.g. you have new information or a new angle. Mention that reviews of your other books, articles or competition pieces are enclosed or can be sent on request. Follow a style guide for the proper formatting and layout of a professional letter. Include your name, address, contact phone number and the date on the right hand side. Use a plain font, size 12, single spacing, with plenty of space in the margins. Try to keep your letter to one page. If you’re not a good speller, don’t rely on a spell-checker; have someone else proofread the draft for errors. Do your research and address the letter to the right person by name. This is always better than ‘To whom it may concern’ or ‘Dear Sir’. If sending out a standard form letter, personalise it and double-check that the details are correct. Take care to exclude information not relevant to the company. Include personal information only if it’s relevant. Don’t include your life story, how much you love writing, or how much all your friends love your writing. Avoid ingratiating comments like ‘I know of your Agency’s high reputation’. Be enthusiastic and confident about your work, but don’t be pushy. Let the agency or publisher know if the manuscript has been submitted anywhere else. Say what you would like them to do with the material if it is unsuitable, e.g. return postage enclosed or discard. Conclude with an invitation to call at their convenience. Don’t say you’ll call in a few days to discuss it or check your manuscript has arrived. The most important thing to remember when preparing your manuscript is to keep it clean and simple. The editor or agent needs to be able to read it quickly and easily, and a professional format is the best way to make a good impression. Print black on plain white paper. Use double line spacing, not single or 1.5. Print in size 12 or 11 font. Use a plain font, like Times New Roman, Arial or Courier, even for headings. Use wide margins, greater than 2cm. Align your text to the left, leaving the right-hand margin jagged, i.e. not fully justified, centred or aligned right. Make sure each page is numbered. Include your name and the title of your manuscript in the header or footer of each page. It’s best to submit consecutive pages, but if you do send a number of excerpts, it’s a good idea to link them for the reader with a few sentences. Send submission by email only if requested. Send via regular mail or express post; don’t make them sign for the parcel. Follow the guidelines of the agency or publisher as closely as possible; if you do need to deviate, make it worthwhile and relevant. Handwrite your manuscript – word process and print it. Illustrate or include graphics, unless asked. Bind your manuscript in any way, but hold it together with a plastic band. Send the original of your work. Always send copies. Deliver your manuscript in person, even if you live just around the corner. Include a synopsis of the entire book – about four to six paragraphs will do, and don’t refuse to give away the ending. The agent or editor needs to know the shape of the story. Include chapter summaries, but keep them short – three to four sentences per chapter. If you are submitting non-fiction, include a chapter outline. Include your publishing history and competition experience. Only include current employment details and previous employment if it is related to your writing or the content of your work. For a professional look, keep consistent styles throughout your proposal including the font, text size, headers and footers, etc. Include a stamped, self-addressed envelope (SSAE) if you want your work returned. Make sure you include enough postage to cover the entire cost of the return of your work. Don’t try to send an SSAE separately to your submission. Always refer to the guidelines of the agency or publisher you are submitting to. Contact them by email or phone to request a copy. This entry was posted in advice about writing, advice for writers, getting a literary agent, literary agents and tagged advice for writers, getting a literary agent, how to approach a literary agent, literary agents. Bookmark the permalink. Thanks so much for the comment, John. I’m thinking of doing a post next on how to discover how many other books are out there on Amazon with the same title as the one a writer might be thinking of using. I know from bitter experience that a Google search isn’t enough.